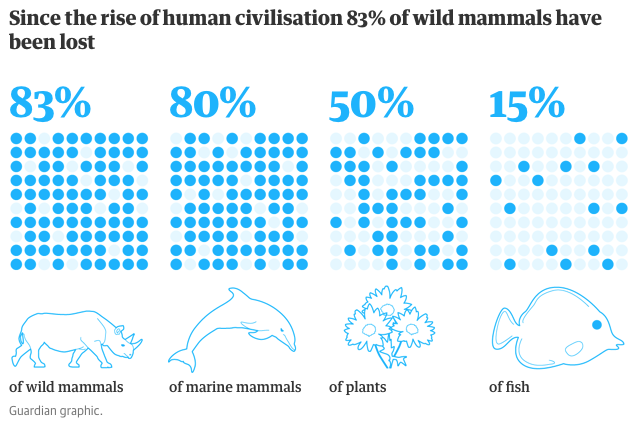 The researchers estimate that, in terms of biomass, the so-called rise of human civilization has destroyed 83 percent of wild mammals, 80 percent of marine animals, 50 percent of plants, and 15 percent of fish. While scientists and conservationists grow increasingly worried about the world’s biodiversity, a new study that sought to estimate the biomass of all living creatures on Earth has shed some light on humanity’s impact. 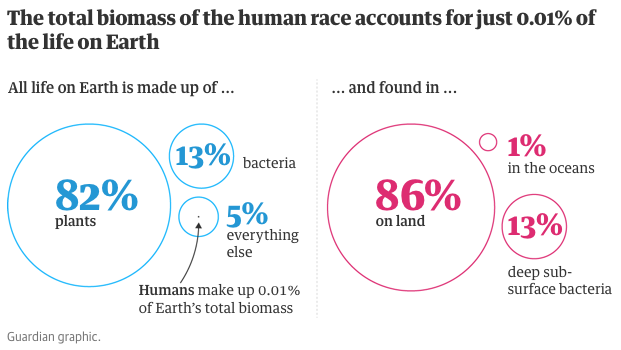 The planet is largely dominated by plants, which make up 82 percent of all life on Earth, followed by bacteria at 13 percent, and the remaining five percent is everything else, including 7.6 billion human beings. According to the study, published Monday by the Proceedings of the National Academy of Sciences of the United States of America (PNAS), people only make up 0.01 percent of the Earth’s biomass—however, their impact has been massive. 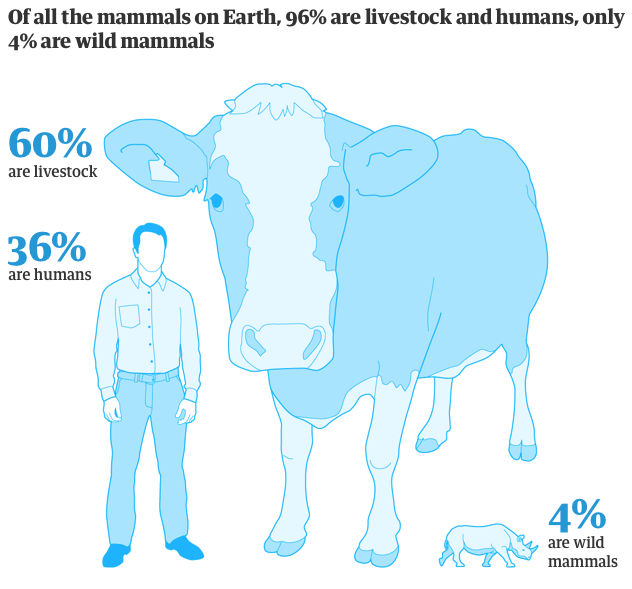 Unsustainable human practices and dietary choices have led to a scenerio wherein 36 percent of mammals are human and 60 percent are livestock—meaning only four percent are wild. “When I do a puzzle with my daughters, there is usually an elephant next to a giraffe next to a rhino. But if I was trying to give them a more realistic sense of the world, it would be a cow next to a cow next to a cow and then a chicken,” he added. The study’s findings provoked both amazement and concern. “Amazing figures showing we should humbly look for a more #sustainable human existence on this planet,” remarked one sustainability organization on Twitter.